I’ve mentioned in prior articles that Soldier 76, Junkrat, and Lucio are my three favorite characters to play, and recently I’ve been attempting to find a favorite tank so I can fill any of the four roles on a team. 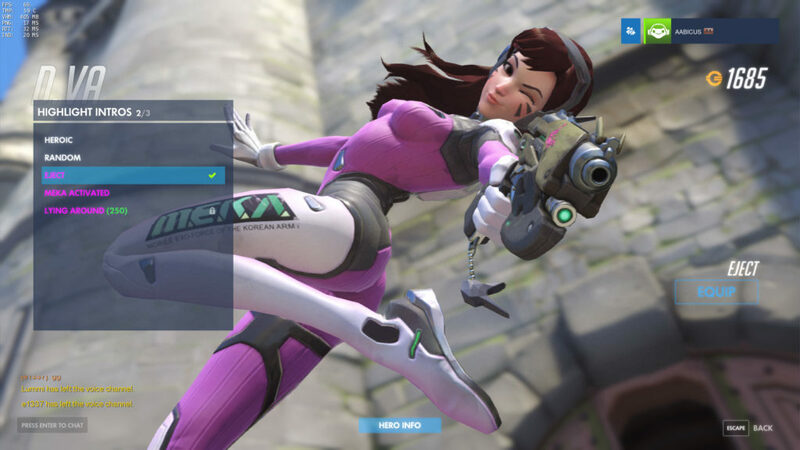 I never thought DVa would be the one who finally clicked with me. TV Tropes has her listed under “mechanically unusual fighter” (not linking, you can thank me later) because she seems to be playing a completely different game from the other characters. While in her meka, she has a very versatile set of abilities; her boosters give her a huge speedboost, her defense matrix lets her block most forms of damage, and she refills her health whenever she switches between meka and human form. This has led to some absolutely insane lives where I keep surviving far longer than I had any right to, spending every second scrambling to keep the enemy at bay long enough for my new meka to recharge. It’s an invigorating playstyle. I like her because of her fast-paced playstyle and her ability to switch between DPS form and Tank form. As a support main, it’s nice to be able to sample both of the other playstyles in a single character. And her jumpjets recharge so quickly that I constantly get to pull off acrobatic ambushes, shred an opponent at close range and bolt for the nearest healthpack. When in human form, I sometimes just hold my ultimate for a while because you can deal some impressive long-range damage with that pistol. I honestly prefer her pistol over her meka cannons, but I wouldn’t want Blizzard to touch anything because the cannons do exactly what they’re supposed to. They have horrible spread but this leads to plenty of headshots, and they don’t need to reload so you have no reason not to hold the button down. DVa feels like she’s playing two different games at once. She’s a great break if you usually play one-trick characters like Lucio. The biggest mistake people make as DVa is playing too passively. They treat her like a tank by hanging with the team, spamming the meka cannons at the enemy Reinhardt shield and bringing up the Defense matrix to block incoming fire. She kinda works in this playstyle (another testament to how many different ways she can be played) but she really excels as a flanker, using boost jets to find lone enemies and destroying them in seconds at close range. She also gives Roadhog a real run for his money, as she can counter his hook combo with her defense matrix and wear his HP down with her no-reload cannons. Considering Roadhog kills my other three mains more than any other character, countering him back is a very cathartic experience. My favorite opener is boosting directly into the enemy and meleeing them right at the end. This deals 75 damage and knocks them back before the fight even starts. And I haven’t even mentioned her Ult, which is amazing for either area denial or blocking an objective push. You can press Q during the meka’s death animation, giving you a chance to survive your first few seconds as human DVa, or in more controlled environments you can boost the ultimate towards the enemy before activating, turning your meka into a nuclear missile. I haven’t quite gotten the hang of boosting my meka upwards so it burns its fuse in the air before landing dead center within the enemy, but there’s nothing more satisfying. 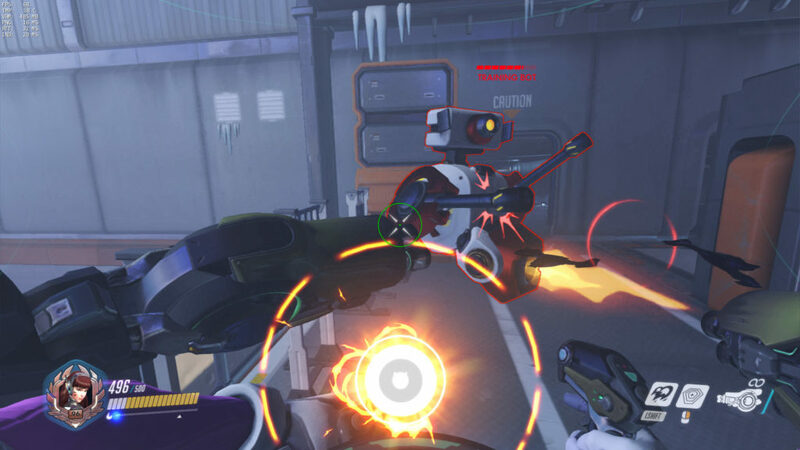 Speaking of airborne DVas, your meka deals damage when you call down a new one (just make sure Genji doesn’t reflect it). 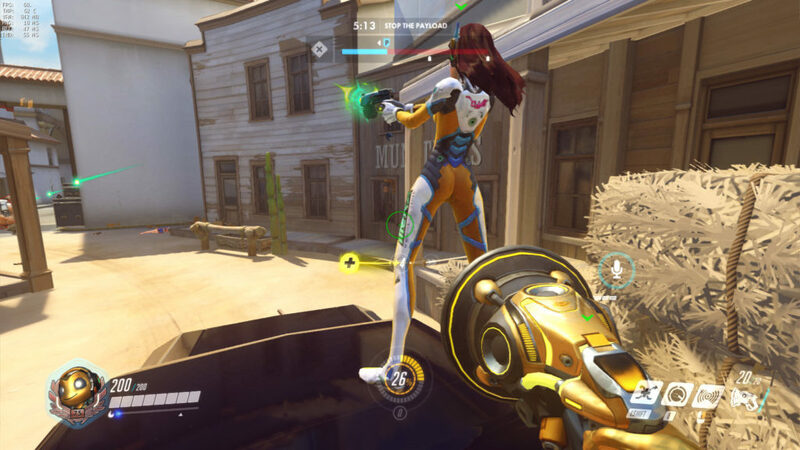 There are so many tiny little ways DVa can defend herself, I think she has the most escape tools of any character. As mentioned before, she has this skin-of-your-teeth survivalist feel to her that makes her a real blast to play.